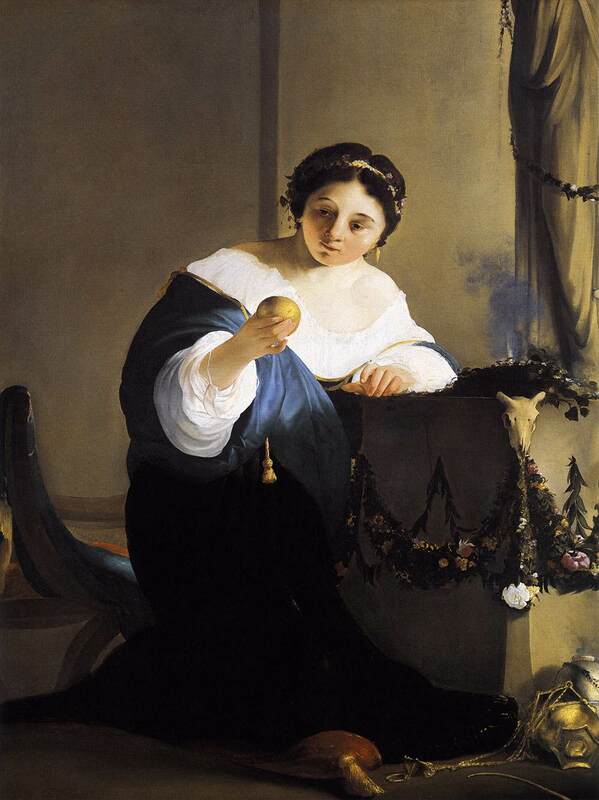 Cydippe with Acontius' Apple by Paulus Bor, ca. 1640. Location: The Rijksmuseum, Amsterdam. Ovid wrote of the love of the prosperous but undistinguished Acontius for Cydippe, the daughter of a wealthy man. While Cydippe was offering a sacrifice in the temple, Acontius cast an apple at her feet, inscribed with the words: 'I vow at the shrine of Diana that I shall wed Acontius'. Cydippe read her suitor's message aloud and, having uttered the promise, was bound to become Acontius's wife. Paulus Bor is the only painter known to have illustrated this tale. He must have been interested in classical literature and he is known to have had a preference for relatively obscure subjects.